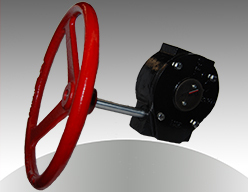 The Series 15 Gear Operators have worm gear drive ensuring pipeline valve fluid flow does not alter valve position. They direct-mount without brackets & couplings on butterfly and ball valves with ISO 5211 mounting pad and shaft dimensions. The Series 15 Gear Operators are compact, lightweight and feature smooth operation. Gear Operator, 15 Brochure 2"-10"
Gear Operator, 15 Brochure 12"-14"
Gear Operator, 15 Brochure 16"-24"